Apr. 24, 2013 — Researchers have identified a burst of high-energy radiation known as ‘dark lightning” immediately preceding a flash of ordinary lightning. The new finding provides observational evidence that the two phenomena are connected, although the exact nature of the relationship between ordinary bright lightning and the dark variety is still unclear, the scientists said. “Our results indicate that both these phenomena, dark and bright lightning, are intrinsic processes in the discharge of lightning,” said Nikolai Østgaard, who is a space scientist at the University of Bergen in Norway and led the research team. He and his collaborators describe their findings in an article recently accepted in Geophysical Research Letters — a journal of the American Geophysical Union. Dark lightning is a burst of gamma rays produced during thunderstorms by extremely fast moving electrons colliding with air molecules. Researchers refer to such a burst as a terrestrial gamma ray flash. (Phys.org)—NASA’s Wide-field Infrared Survey Explorer (WISE) mission has led to a bonanza of newfound supermassive black holes and extreme galaxies called hot DOGs, or dust-obscured galaxies. Images from the telescope have revealed millions of dusty black hole candidates across the universe and about 1,000 even dustier objects thought to be among the brightest galaxies ever found. These powerful galaxies, which burn brightly with infrared light, are nicknamed hot DOGs. WISE scanned the whole sky twice in infrared light, completing its survey in early 2011. Like night-vision goggles probing the dark, the telescope captured millions of images of the sky. 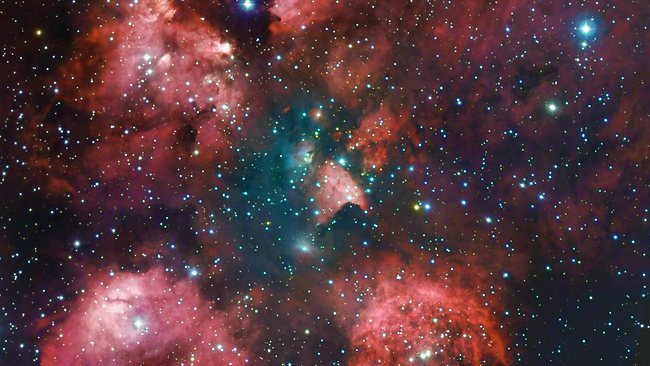 All the data from the mission have been released publicly, allowing astronomers to dig in and make new discoveries. ASTRONOMERS in Chile using a powerful telescope have observed what appears to be evidence of the existence of dark galaxies, the European Southern Observatory (ESO) says. Dark galaxies are small, gas-rich galaxies from the early universe that are believed to be the building blocks of today’s bright, star-filled galaxies, said the ESO, an intergovernmental organisation supported by 15 countries. “For the first time, dark galaxies – an early phase of galaxy formation, predicted by theory but unobserved until now – may have been spotted,” the observatory said in a statement on Wednesday. “Using ESO’s Very Large Telescope, an international team thinks they have detected these elusive objects by observing them glowing as they are illuminated by a quasar,” the statement said. ScienceDaily (July 9, 2012) — Observations with CSIRO’s Australia Telescope Compact Array have confirmed that astronomers have found the first known “middleweight” black hole. Outbursts of super-hot gas observed with a CSIRO radio telescope have clinched the identity of the first known “middleweight” black hole, Science Express reports. Called HLX-1 (“hyper-luminous X-ray source 1”), the black hole lies in a galaxy called ESO 243-49, about 300 million light-years away. Before it was found, astronomers had good evidence for only supermassive black holes — ones a million to a billion times the mass of the Sun — and “stellar mass” ones, three to thirty times the mass of the Sun. “This is the first object that we’re really sure is an intermediate-mass black hole,” said Dr Sean Farrell, an ARC Postdoctoral Fellow at the University of Sydney and a member of the research team, which included astronomers from France, Australia, the UK and the USA. Invisible, cold dark matter plays a major role in the evolution of galaxies, according to modern cosmological theory. 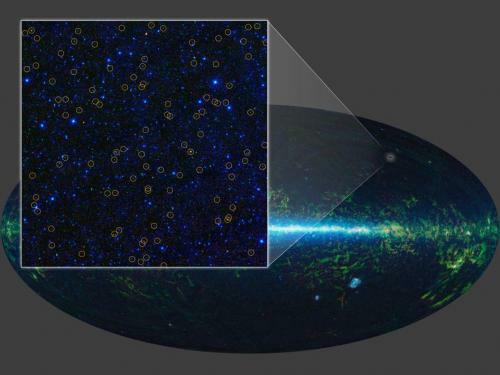 The most advanced simulations of cosmic evolution show stringy tendrils of mass — dark matter — connecting giant clusters of galaxies via a vast cosmic web. Now for the first time, astronomers have been able to detect one of these filaments, sussing out its location by watching it warp light.